Welcome to the home page of Tynamo™, a fast, conditionally compliant HTTP/1.1 server and Servlet 2.2 container for embedded Java platforms. Look in the contents to the left for download and purchase information, and below for the latest news. Also check out some customer comments. A few links to Tynamo™ demos can also be found below. 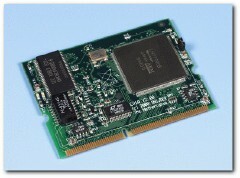 The TINI platform (and TStik and SoM-400EM implementations) runs most of Java 1.1.8, the JStik and SaJe platforms use the aJ-100 processor to provide a CLDC environment, and the SNAP lives somewhere in between. Why Is This a Good Solution? Web browsers for your user interface. These exist for almost every platform. HTML and server-side design techniques: Forms, Java applets, Servlets, stylesheets, XML, scripting. There is a vast range of measurement and control possibilities that a standards-compliant server provides. Remotely update a custom FPGA! Access realtime weather data from another hemisphere. Monitor a camera on a mobile robot. Browse the status of your equipment. Provide a gateway for external SNMP control. Of course, the oft-cited: Connect your toaster to the internet. ...and all this through a standard web browser. 13-Mar-2007 -- Tynamo-SNAP/1.0.4 released! Check out the downloads page to access the distribution. This release includes several fixes and improvements. 07-Mar-2007 -- Tynamo-TINI/1.0.4 released! Check out the downloads page to access the distribution. This release includes several fixes and improvements. 21-Dec-2005 -- Tynamo-SNAP/1.0.3 released! Check out the downloads page to access the distribution. This release includes many enhancements over 1.0-RC1. 19-Oct-2004 -- I will be at the RoboNexus conference this year, affiliated with the Systronix booth. 20-Jun-2004 -- I will be at JavaOne this year, affiliated with BOF-3002 and BOF-3044, and possibly one of the Sun demo pods. 10-Sep-2003 -- Check out Jan Axelson's latest book, Embedded Ethernet and Internet Complete. There is a good discussion of Tynamo™. "Shawn helped us with a read-only FLASH file system for TINI. The code was well designed, style consistent, and well documented. I was impressed." "I've been using Tynamo to bring up a bevy of one-wire sensors and switches for my pure Electric Vehicle. The out of the box one-wire servlet has been a god send. Tynamo has run for months on one of my TINI's without a glitch — wish I could say the same for my WinDoze machines. One added benefit of my Tynamo time is learning Ant and TiniAnt from Shawn's lucid and well commented build.xml Ant script." "Before I found Tynamo, I made my own patches to alternative webservers every 6 months or so, just when I have forgotten what fix I did last time... This was getting so frustrating that I went looking for another solution, and found Tynamo. Now I don't look anymore. Nor do I patch anymore. Shawn does the development and support of Tynamo, and I can concentrate on my real project, making an access/surveillance system over IPv6 based on TINIs. Thanks Shawn!" "Shawn has helped us tremendously to setup a Tynamo webserver which incorporates our Java CLDC version of JmDNS (a Java version of ZeroConf protocol). This is a multicast DNS which enables devices on a network to automatically discover themselves and advertise their services without the need for configuration. 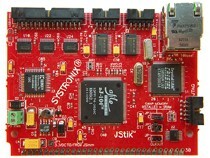 Our platform is a cluster of Systronix JStik real-time microcontrollers. The above features is a layer in our modular robotic motion controller architecture. The neat thing about the webserver is that it will eventually lead to a web based GUI and monitoring system." "Thank you for a thorough and well planned tutorial. It is exactly what I needed to get going. Frankly, I don't know what I'd have done without it." Below are links to Tynamo™ demos running at various locations around the world. If you would like your own demo listed here, then please contact us. This demo is running on a SNAP in Finland. It controls heating, lights, and air conditioning in a cottage. A demo running on an aJile board by Mario Weissert (Choose your language, click on "Demonstrations", and then click on "Stepper motor control with real-time Java"). Images on this site copyright their respective owners and are used with permission. Hosted by Web Wizards Inc.